Apple just paid $18.2 million for a small 70,000 square foot silicon chip fab, formerly owned by Samsung, located in North San Jose, California, about a 20 minute drive from its current Infinite Loop headquarters in Cupertino. 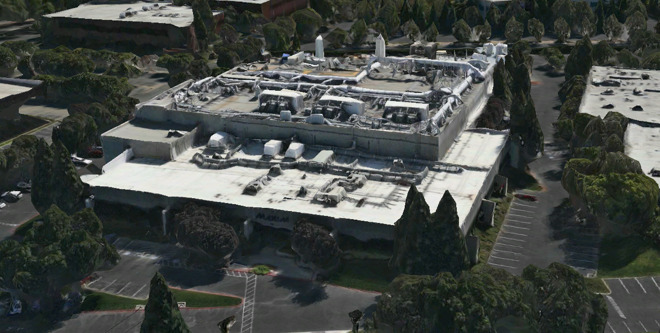 According to a report by Nathan Donato-Weinstein of the Silicon Valley Business Journal, the building had been operated by Maxim Integrated Products as a low volume manufacturing facility and supported process technology development. Maxim closed the "X3" facility in July. It had originally acquired the plant from Samsung back in 1997. It sits next to a new 10-story building now under construction by Samsung Semiconductor, and is surrounded by buildings used by Cisco and a variety of other network and semiconductor firms. Maxim marketed the property for use as an operational fab, noting that it would be "well suited for prototype, pilot, and low-volume manufacturing." The listing agent added, "this facility is capable of producing a wide array of products at multiple technology nodes ranging from 600nm to 90nm, with the bulk of production from 350nm to 180nm." The property also included "a complete tool line consisting of 197 well-maintained front-end tools from such OEMs as AMAT, Hitachi, Novellus, LAM, TEL, KLA, and ASML." Apple's core production of chips used in Macs and iOS devices is manufactured by a broad range of partners, including Samsung, Intel, Broadcom, Texas Instruments and many others, typically at far more advanced process nodes than the newly acquired site is capable of delivering. However, the relatively small fab could allow the company to prototype new chip designs or perform other "heavy R&D" activities, including custom tools for developing and testing its products at other sites. By way of comparison, the Samsung ARM chips used in the original iPhone and 3G were built using a 90nm process, while the iPhone 3GS used 65nm technology. Apple's latest iPhone 6s uses 14-16nm A9 chips, although other supporting chips are often manufactured with less advanced fab technology in order to save money. For example, last year's M8 motion coprocessor was manufactured at a 90nm process. Ten minutes' drive down the road (or four stops on the VTA light rail train) south from the former Maxim plant, Apple has pieced together another 86 acres of land in San Jose, including undeveloped land formerly owned by Lowe and the 101 Tech campus that formerly served as the headquarters for semiconductor manufacturer Atmel. Apple hasn't yet submitted plans for the site, which sits just north of San Jose's Mineta International airport and has a direct VTA connection to downtown San Jose. Apple did issue a statement by email saying, "as we continue to grow, we're planning to build R&D facilities and some additional office space in San Jose. The property isn't far from the future home of our new campus and we're looking forward to expanding our presence in the Bay Area."